Rated PG-13 for thematic elements including brief war violence. Over the past 20 years or so, Francois Ozon has proven himself to be one of France’s most daring and audacious filmmakers through such works as “See the Sea,” "Under the Sand," "8 Women,” “Swimming Pool,” “Young and Beautiful” and “The New Girlfriend.” Even on those occasions when his work hasn’t been up to snuff (such as the odd period romantic drama “Angel” and the bizarre fantasy “Ricky”), he at least had the grace to make them into interesting failures that showed his will to try different things. At first glance, his latest effort, “Frantz,” would seem to be just as daring based solely on the fact that it finds Ozon attempting to remake a film—albeit a lesser-known one—by a true legend of cinema, the great Ernst Lubitsch. Unfortunately, “Frantz” is a film that displays precious little evidence of the distinctive touch of either Lubitsch or Ozon. While it is far from Ozon’s worst movie, it is perhaps the first one he's made that feels like it could be the work of any other director. Based on the 1932 anti-war drama “Broken Lullaby,” itself inspired by a Maurice Rostand play whose title shall go unremarked here as it technically constitutes a spoiler, “Frantz” begins in the small German town of Quedlinburg just after the end of World War I and focuses on Anna (Paula Beer), still mourning the death of her fiancée, Frantz Hoffmeister (Anton von Lucke), on the battlefield a year earlier. One day, while visiting Frantz’s grave, she discovers a mysterious Frenchman named Adrien (Pierre Niney) has been paying his respects as well. Anna confronts Adrien, who tells her that he and Frantz were friends in Paris before the war. Delighted by this, she brings Adrien back to the home that she shares with Frantz’s parents, Hans (Ernst Stötzner) and Magda (Marie Gruber), so that they can meet him. At first, Hans rejects the idea of meeting him, but a thaw begins to develop, and the Hoffmeisters welcome Adrien into their home so that he can regale them with tales involving him and Frantz in Paris before the war. Something also seems to be slowly developing between Adrien and Anna as well. While the Hoffmeisters are perfectly happy with this, fully recognizing the need for her to get on with her life, others in town are not quite as forgiving, especially Kreutz (Johann von Bulow), who has been pressing Anna hard to marry him despite her utter lack of interest. He is also appalled by the prospect of losing her hand to anyone else, let alone a Frenchman. It is only a matter of time before the other shoe drops and Adrien abruptly returns to France after revealing some shocking news. Anna impulsively decides to follow him and as she searches the places that Adrien mentioned in his tales of him and Frantz in the hopes of tracking him down, she makes some additional discoveries about him. More directly, she finds herself trying to discover whether she sees Adrien as just a substitute for her dead Frantz or as the beginning of a new and unexpected chapter in her own life. When Lubitsch told this story back in 1932, World War I had been over for only 14 years and therefore no doubt resonated strongly with audiences still bearing the physical and emotional scars of that conflict. Although the underlying warnings about the horrors of war and the perils of blind nationalism will always be relevant, there is an inevitable lack of urgency to the basic narrative that Ozon is never quite able to overcome. For example, one of the most powerful scenes in “Broken Lullaby” arrives when Dr. Hoffmeister, there played by Lionel Barrymore, comes across a group of fellow villagers in the local pub being led in anti-French sentiment by Kreutz. Barrymore's character admonishes them by reminding them that they are just as guilty for the death of their sons as the French soldiers that shot them because they were the ones who unthinkingly sent them off to battle to be slaughtered. In 1932, this scene must have been devastating to audiences of the time; in Ozon’s version, it just comes across as a melodramatic monologue and nothing more. Perhaps recognizing this, Ozon has tried to shift the focus of the story from the antiwar sentiments that dominated the original film to emphasize the romantic elements, even going so far as adding on all the stuff involving Anna following Adrien to Paris. This is a move that winds up having mixed results. 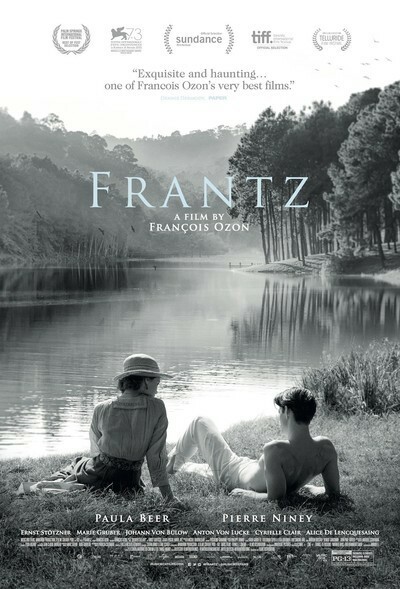 On the one hand, Ozon seems to connect more directly with this material, especially in the way that the emphasis of the story is now centered on Anna and her inner turmoil rather than on the relationship between her and Adrien, which never quite comes alive due to Niney's odd performance, whose Adrien demonstrates more genuine on-screen chemistry with Frantz than he does with Anna. (In a move that will no doubt disappoint Ozon fans, nothing is made of this particular development.) On the other hand, despite the good performance by Beer as Anna, the shift means, among other things, that Frantz’s parents end up disappearing from the latter half of the film in what becomes an increasingly glaring absence. The other real problem with “Frantz” is that it is a curiously muted and unambitious effort for a director as normally audacious as Ozon. Apart from a couple of minor stylistic quirks, such as shooting in a black-and-white that occasionally bleeds into color during the pre-war flashbacks, even the most keenly aware fan would be hard-pressed to recognize it as one of his films. In fact, there is really only one scene that comes close to approaching the daring that he is usually known for—a powerful moment in which he takes one of the most famous scenes in movie history, the singing of “La Marseillaise” in “Casablanca,” and slyly subverts it in order to show the incipient violence and cruelty hiding just beneath the surface patriotism. If “Frantz” had contained more moments like that, it might have developed into a genuinely powerful drama worthy of its immensely gifted director instead of just a well-meaning drag.